A workshop highlighting economic and trade co-operation potential between Vietnam and Indonesia, one of the top priorities of their strategic partnership, was held in Hanoi on August 19. 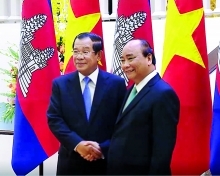 Chairman of the Vietnam-Indonesia Friendship Association Nguyen Dang Tien cited that two-way trade had topped US$5.4 billion in 2015 and is expected to hit US$10 billion in 2018. The establishment of the ASEAN Economic Community at the end of 2015 will enable businesses to make the best use of investment opportunities to fulfill the bilateral trade target, he said. Indonesian Ambassador to Vietnam Ibnu Hadi evaluated that as ASEAN member states, Vietnam and Indonesia share a lot of similarities such as income and strong economic growth. Both are looking towards industrialisation in agriculture, fisheries and mining, he added. The two countries also have a young population, efficient labour forces and improved infrastructure, he said, adding that the two governments define each other as key partners and hope to increase bilateral relations to a new height. Indonesia mainly imports mobile phones and rice from Vietnam, while shipping various products like paper, automobile spare parts and motorbikes to the Vietnamese market. 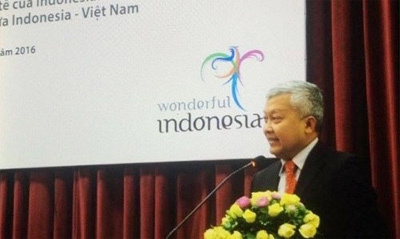 Fifty-four Indonesian companies are operating in Vietnam. Indonesia is the fourth most populous country in the world with over 250 million people, while Vietnam ranks 14th globally with over 90 million./.